Now, most people know about Edgeville, but don't know the location, or what it's used for. 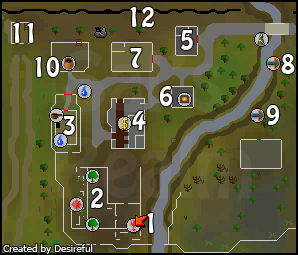 A lot of people don't know why it's called "Edgeville" but this guide will help you answer all of the questions you've been wanting to answer. First off, there are many uses of Edgeville, and so much, that it can't fit into this little introductory part. But, here is the answer the second question. The city is called "Edgeville" because it is on the very edge of the wilderness. This is where most people enter through the wilderness. There are several ways of getting to Edgeville. 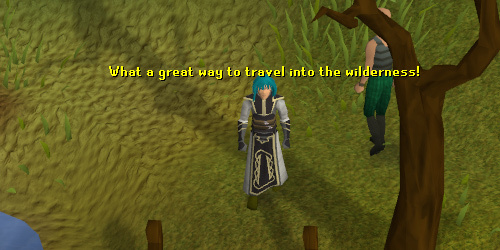 In this section, you will learn the several ways to get to Edgeville, easily without any trouble. You just basically have to know your way around a little! In order to get to Edgeville, you will need a certain required woodcutting level to get to Edgeville depending on where you are. For more information on these required levels, please see the Canoe guide. You can also get to Edgeville by using Fairy Rings, only if you completed In order to use this way of transportation, you must start A Fairy Tale Part 2: Cure a Queen. The combination is "DKR". Like most cites, you can teleport to. But for Edgeville, it's not listed under your Spellbook, as you probably already have noticed. But if you are a Member, you can use the Amulet of Glory to teleport you to Edgeville, as long as it still has charges in it, of course. There is also another way that's fast to get to Edgeville. If you have a Skull Sceptre, then you can teleport from wherever to Barbarian Village. Head directly north towards the Barbarian pub, past that, across a small field, and then you end up in Edgeville. Another way is to simply walk to Edgeville. You basically need to go to Barbarian Village and head north to get to Edgeville. The trapdoor is a secret entrance to the Edgeville Dungeon, the most popular dungeon in Freeplay. Some inhabitants of the dungeon include Hill Giants (level 28), Zombies (levels 18 and 24), and Skeletons (level 21, 22 and 25). In the members' only section of the Edgeville Dungeon, there are, among other things, the Air Obelisk and Earth Obelisk, allowing you to make Air and Earth Battlestaffs. In terms of monsters, the members' section has highly aggressive Thugs (level 10), Chaos Druids (level 13) and Black Demons (level 172). 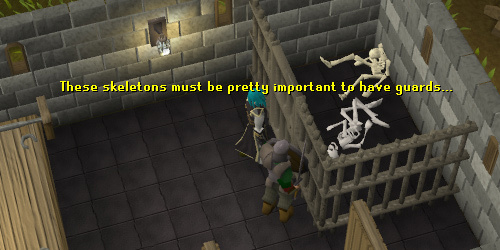 The members' only section of the Edgeville Dungeon is in the Wilderness, so be prepared for anything. In addition to monsters, there's also a good mine, which contains Adamantite, Mithril, Coal, Iron, Silver, and Clay rocks. 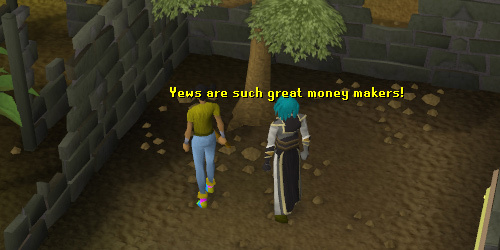 If you are looking for some good yew trees that are easy to bank, then Edgeville is your place. There are two Yew trees, fairly close to the Edgeville Bank. These usually have a lot of autoers/macroers hanging around, so you wouldn't get as much logs as you should have. To chop down yew trees you must have a Woodcutting level of 60, but in order to get more logs, most people chop down yew trees at around level 75 or 80. Evil Dave and his mother, Doris, reside in this house. 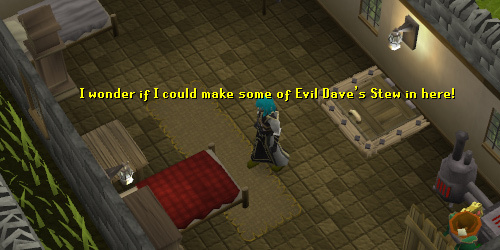 During Part 6 of the quest Recipe for Disaster, you will need to make Evil Dave's perfect stew. Dave's house also contains a sink and range. The Edgeville bank is the best place to stop right before you head off into the mysterious ruins of the wilderness. Here you can stock up on food and weapons, even sell some to other players! Since there is all of this going on, this is the perfect spot for a clan to meet right before a big PK-ing trip! 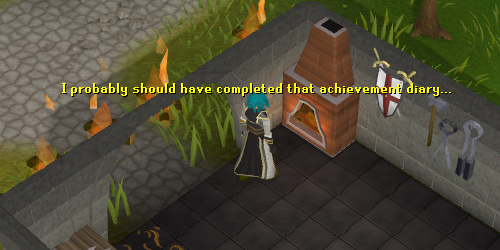 Edgeville bank is also known for people to train their Firemaking skill all the way to level 99. This is because once you exit the bank to the south, there are perfectly straight lines to set fires. 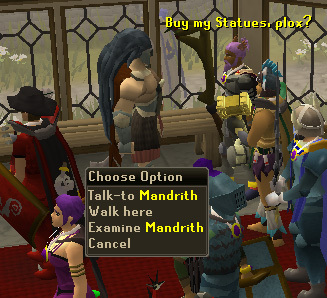 Also in this bank is an NPC named Mandrith who was introduced when PvP existed were in RuneScape. Since their removal, the previously PvP-only drops such as statuettes and brawlers are now dropped by Revenants and sold to Mandrith in Edgeville bank. 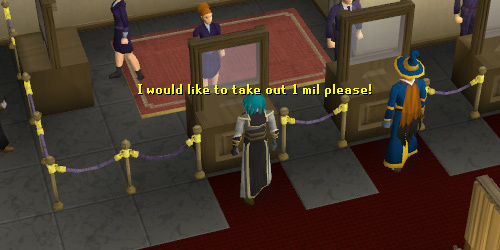 Not like any other cities, Edgeville has its very own small jail. If you are looking to train your combat or any combat related skill, there are several guards walking around that you can train on. If you are also looking for an iron mace, or want to try and sell some, there's a respawn of iron maces in the corner of the jail. Due to the Varrock Tasks, there is now a furnace here. The bad thing is, though that not all people can use it. 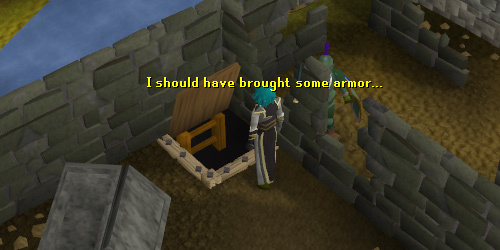 You have to finish Varrock's Easy tasks and wear the Varrock Armor which is a reward from the Easy tasks to get in. This is a fantastic place to smelt because the furnace is several steps away from the bank, for fast smithing experience. 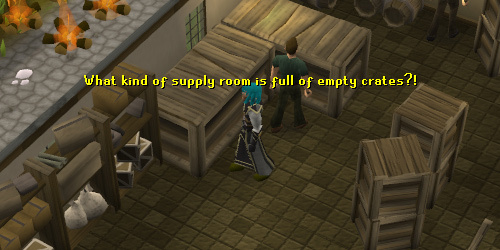 In this small little place, this is where all of Edgeville's materials are placed. There are many crates and barrels and lots more! Okay, not really, you hardly ever get anything out of them, even on the second floor! So mostly, this room has no point unless you wanted to train your Thieving on a level 2 Man or Woman. This is also a common place for lower levels/Defence pures. One of the ways into the Wilderness, in to Edgeville, or out of Edgeville is by the use of canoe. But if you take a canoe to the wilderness, you won't be getting a ride back! This is a better way to travel if you don't train magic, or you don't like walking, or you just love the skill of woodcutting. 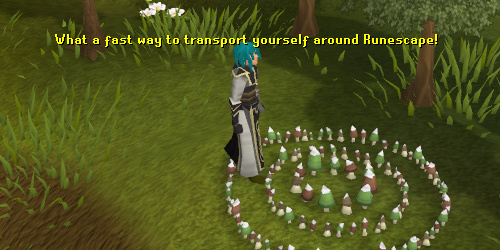 A way to arrive or leave Edgeville is by use of the Fairy Rings. In order to use this way of transportation, you must start A Fairy Tale Part 2: Cure a Queen. At the Edgeville General store, like all general stores have an infinite amount of each stock in the main part of the store. So if you're looking for a lot of one item, a general store like this is your place! There is also the player stock, but usually there isn't anything in there. If you are fletching though, there are a lot of un-strung bows sold there. Oziach will sell you a Rune Platebody and Green D-hide bodies, after you have completed the Dragon Slayer quest. He will sell you them at very cheap prices, and he also has an infinite amount of each one, so in case you died and lost your rune plate, you can go get one without any hassle! Also, if you trade Oziach, you can complete one of the medium-difficulty Varrock Tasks. At the edge of Edgeville, you will find Richard walking around with a heavy load on his back. He can sell you some of the team capes for a very cheap prices! Team capes are used in PK-ing to show what team the person is on normally, but some people just like to wear them because of their distinct design and colors. Also, if two people are wearing the same cape, and try to fight each other in the wilderness, they won't be able to unless one of them takes the cape off. 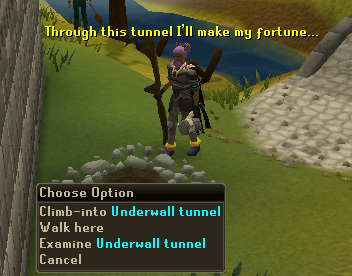 This tunnel will take you from Edgeville to the northwestern corner of the Grand Exchange and vice-versa. In order to use this shortcut you need 21 Agility. This beacon can be lit as part of the All Fired Up activity and requires 62 Firemaking to light.